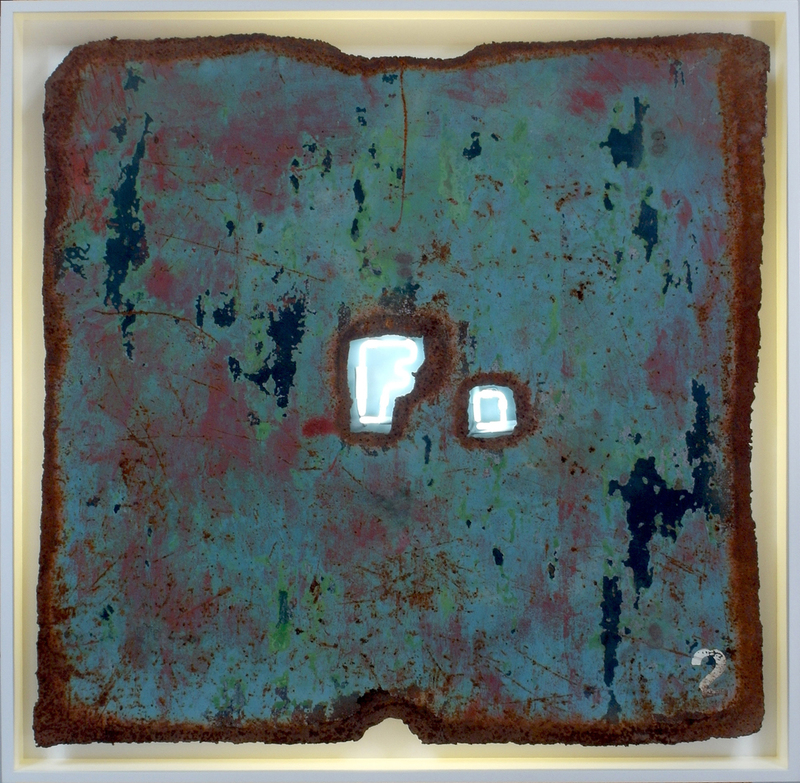 Acrylic on routed MDF panel, with electroluminescent inlay. 116 x 238 x 3 cm. Unique artwork. Neon, stainless steel spoons, steel matrix, plywood in heavy acrylic vitrine. 81 x 220 x 20 cm. Unique artwork. Acrylic, metal leaf appliqué, permanent marker, LED luminaires on MDF. 228 x 81 x 8.5 cm (Each). Unique artwork. 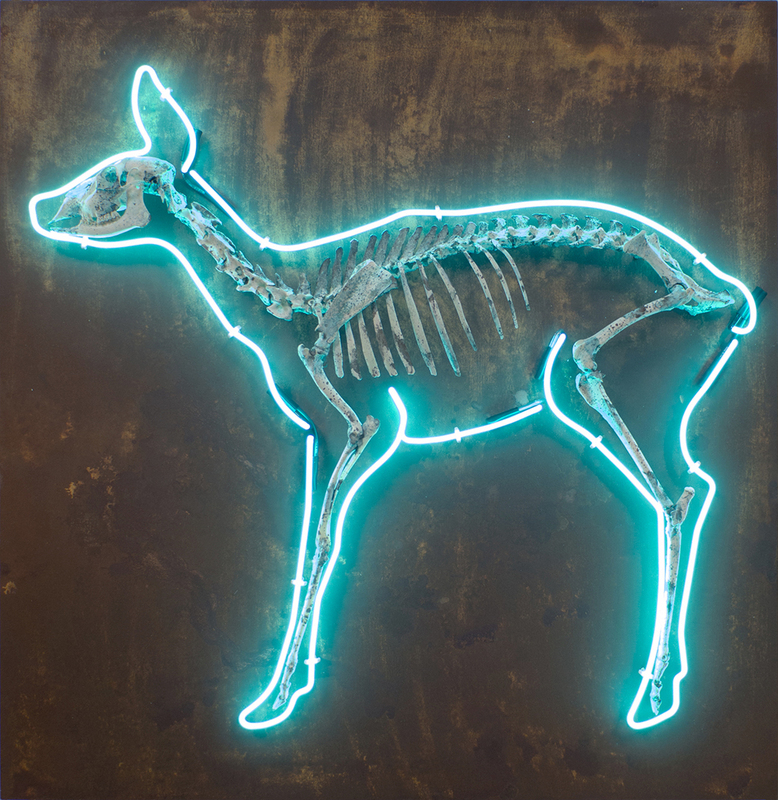 Neon, steel and enamel on plywood mounts. 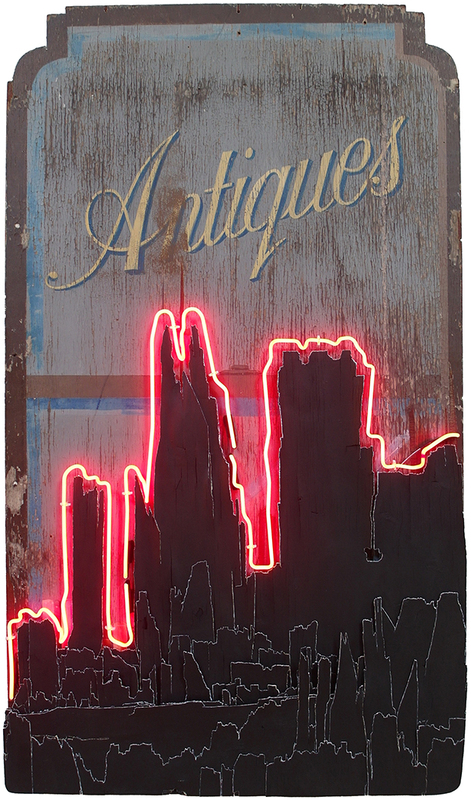 Neon, steel and enamel on plywood mounts. 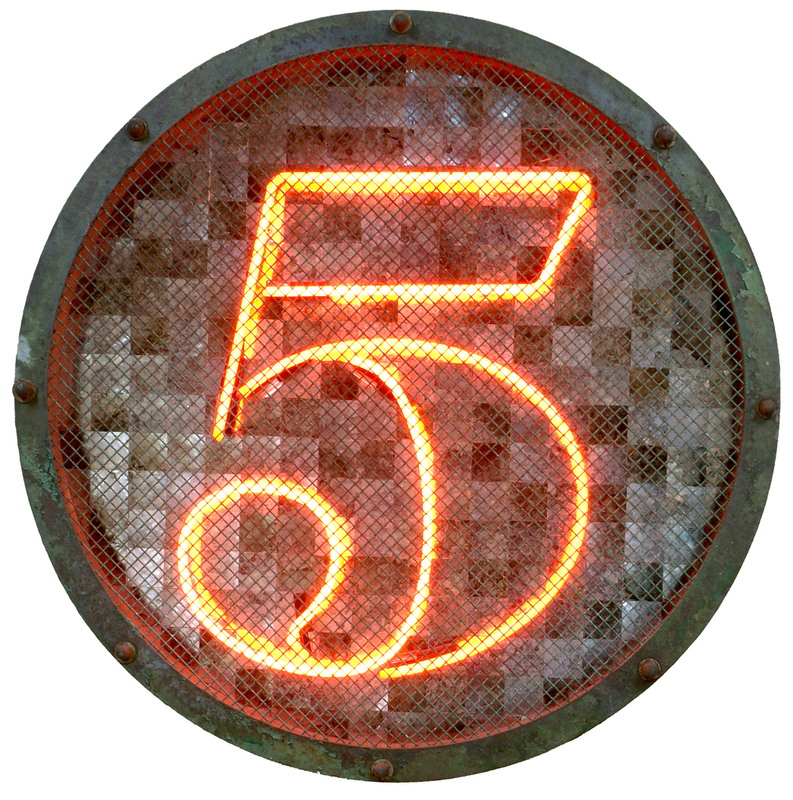 51 X 76 10 cm (Each). Unique artwork. 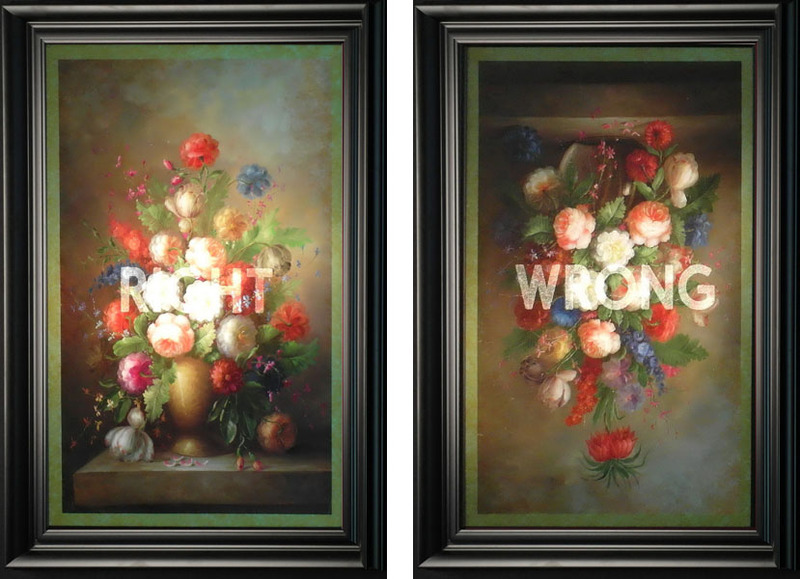 Digital print, foamex panel, electro-luminescent inlay in flocked ornate frame. 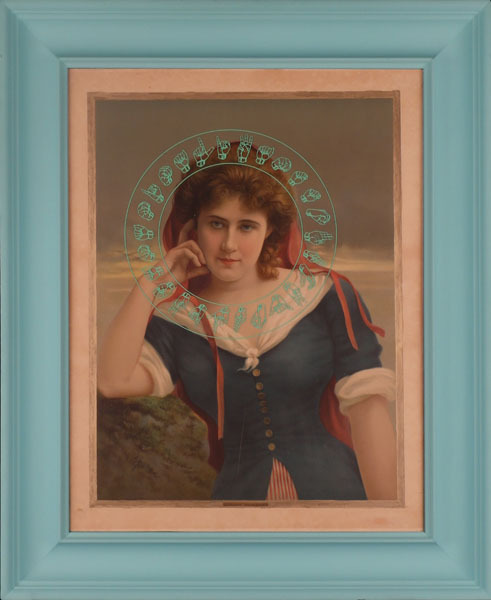 Digital print, foamex panel, electro-luminescent inlay in flocked ornate frame. 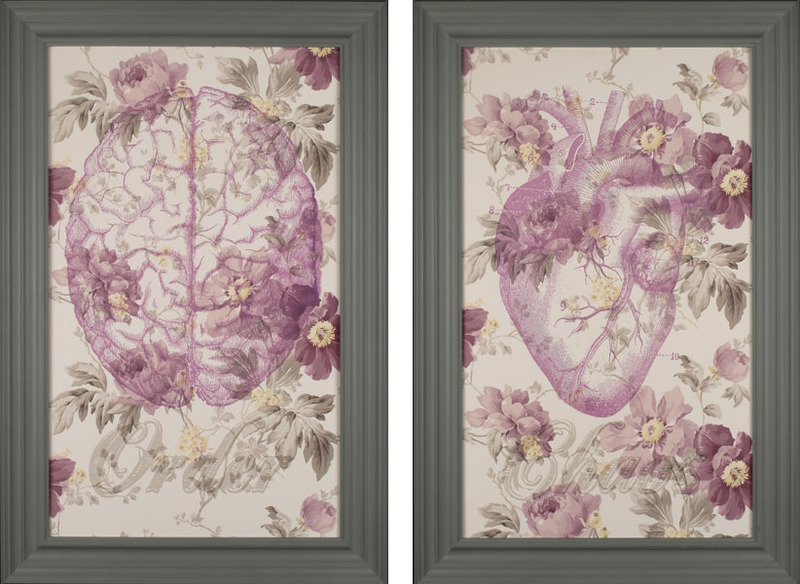 99 x 129 x 11 cm. Unique artwork. Acrylic on canvas. Framed. 210 X 262 8 cm. Unique artwork. Neon on MDF panel with scrim and emulsion. 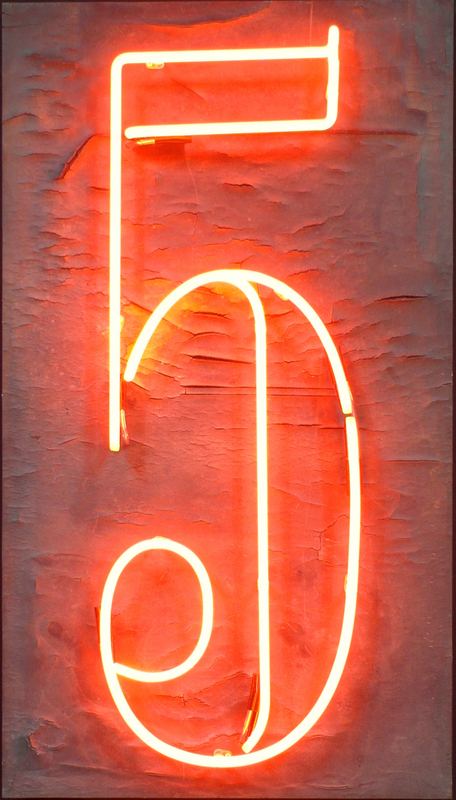 Neon on MDF panel with scrim and emulsion. 119 x 65 10 cm. Unique artwork. 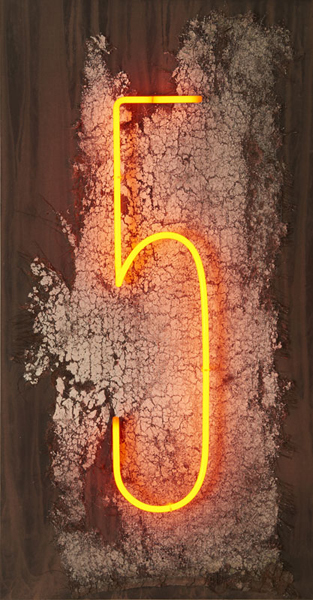 Neon oxidised steel, laminate, French enamel varnish with LED luminaires. Acrylic screen print, micro-spherical bead appliqué on gold HIPS Edition of 25. Part of series. 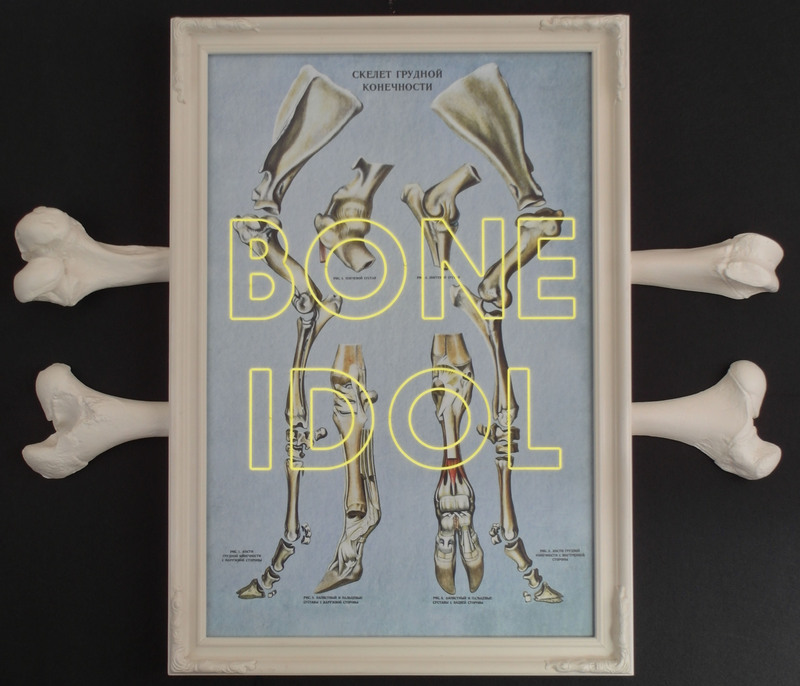 Digital print, foam-x panel, EL wire inlay, animal bone in ornate frame. 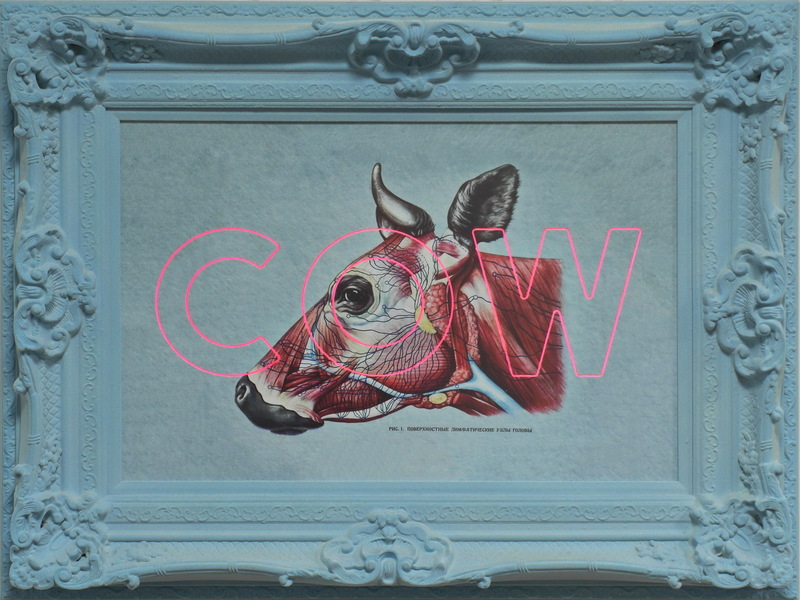 Digital print, foam-x panel, EL wire inlay, animal bone in ornate frame. 129.5 x 99 x 11 cm. Unique artwork. 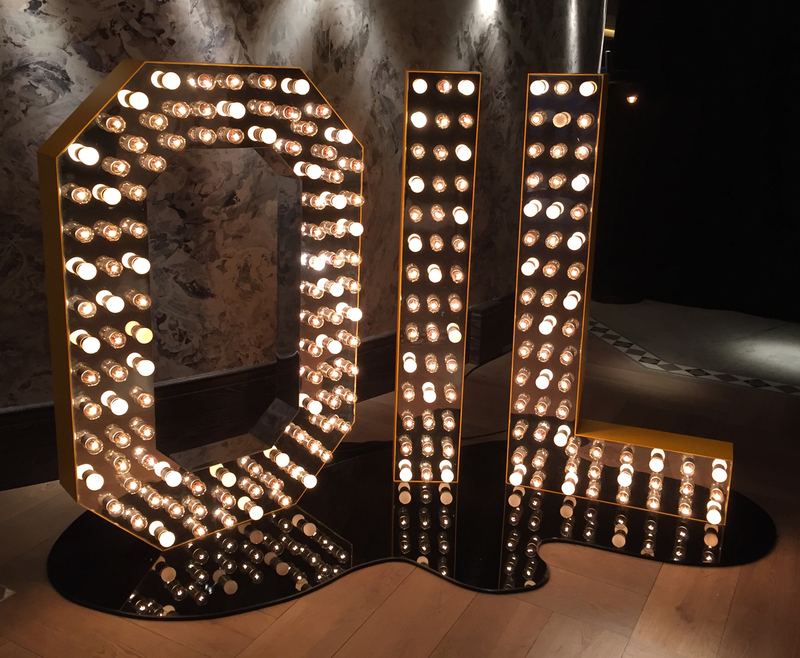 Plywood, mirror laminate, tungsten luminaires, enamel paint and black acrylic base. Plywood, mirror laminate, tungsten luminaires, enamel paint and black acrylic base. 220 x 145 x 20 cm. Unique artwork. Screen print, acrylic and EL wire in routed MDF panel. Screen print, acrylic and EL wire in routed MDF panel. 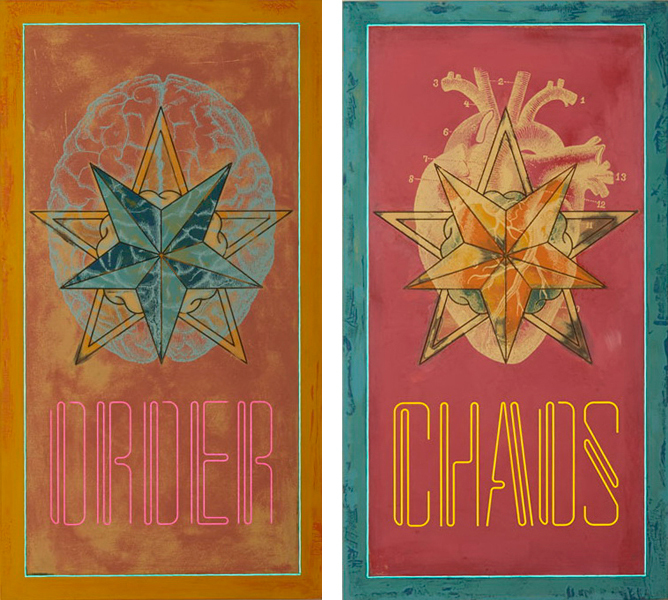 122 X 66 X 5 cm (Each) Unique artwork. Acrylic on routed MDF panel. 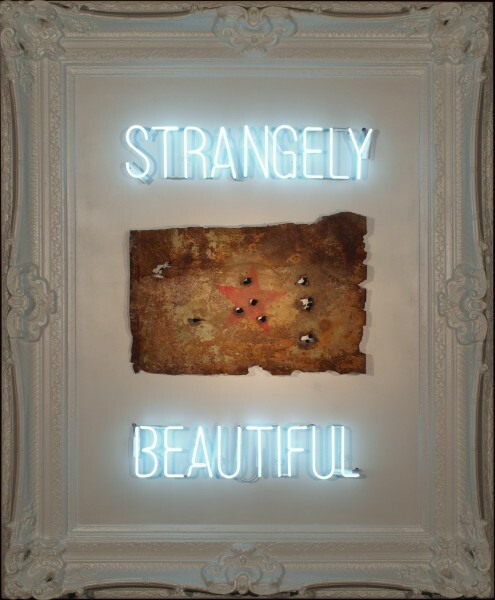 116 X 238 X 3.6 cm Unique artwork. Acrylic, metal leaf appliqué on routed MDF panel. Acrylic, metal leaf appliqué on routed MDF panel. 116 X 238 X 3.6 cm Unique artwork. 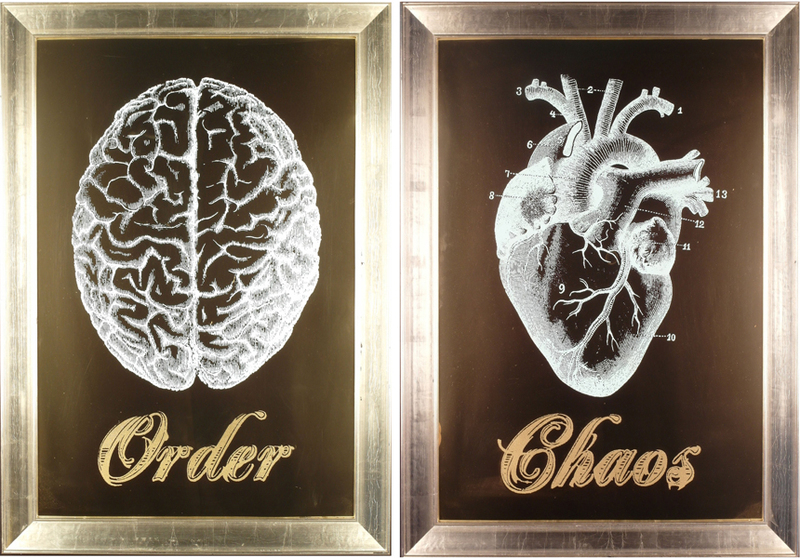 Screen print, Digital print framed. Screen print and acrylic on routed MDF panel. 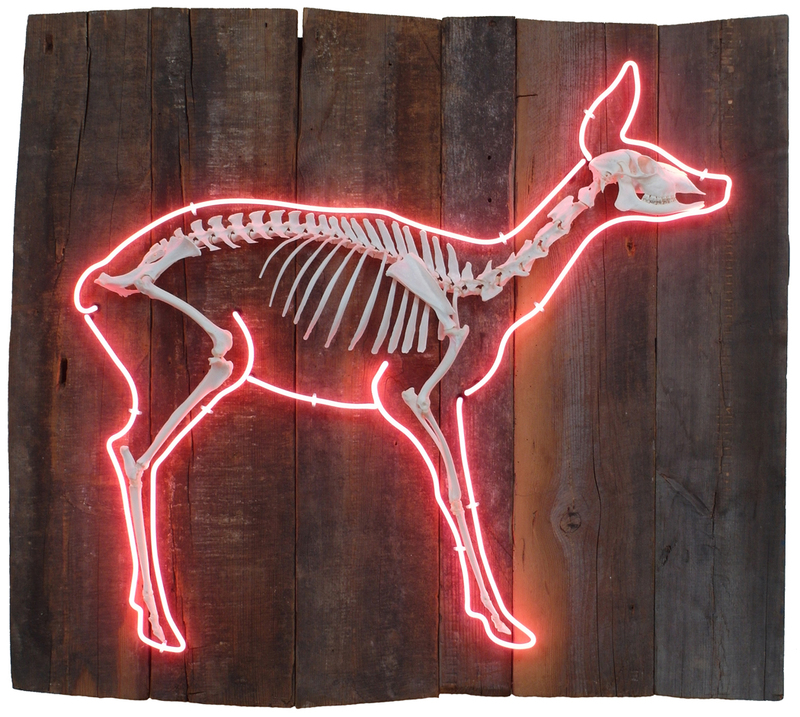 Stag skull and antlers, mid-20th century fairground game with fairground luminaries. 175 X 78 X 55 cm Unique artwork. 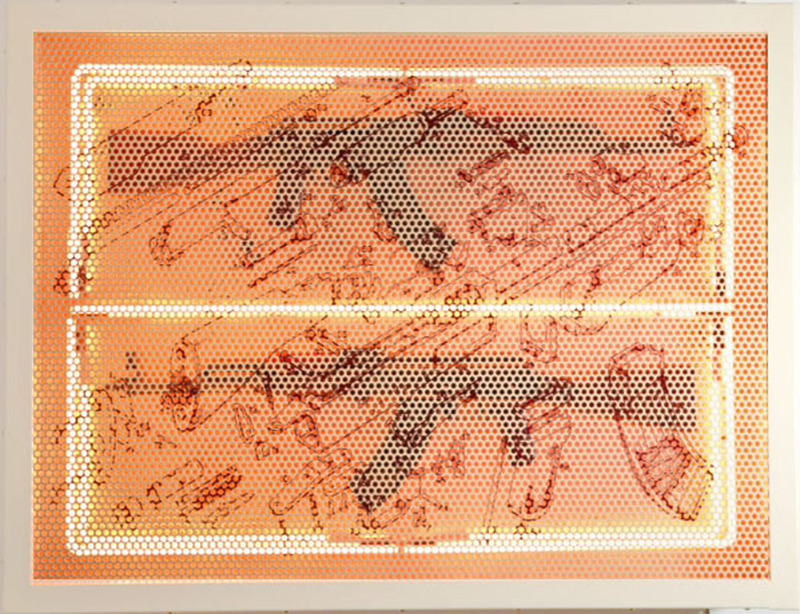 Spring steel, polystyrene pistols, US dollars on light box in heavy acrylic vitrine. Spring steel, polystyrene pistols, US dollars on light box in heavy acrylic vitrine. 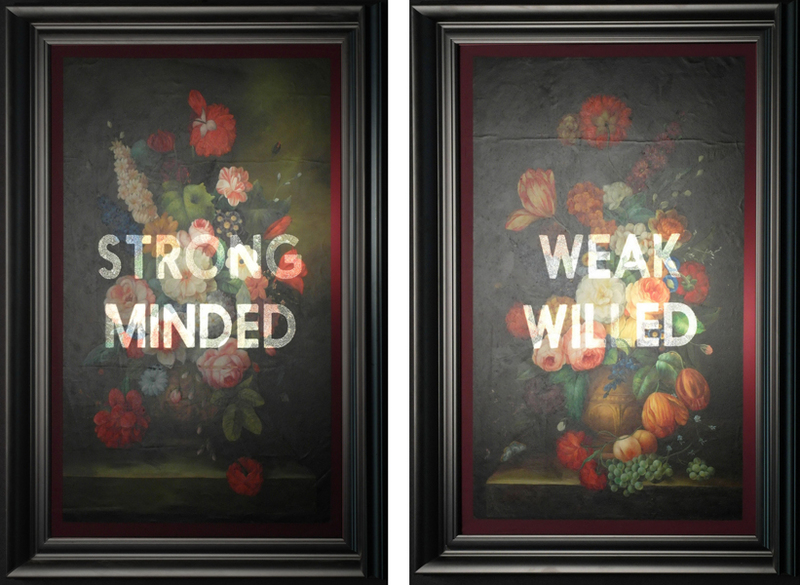 189 X 76 X 27.5 cm Unique artwork. 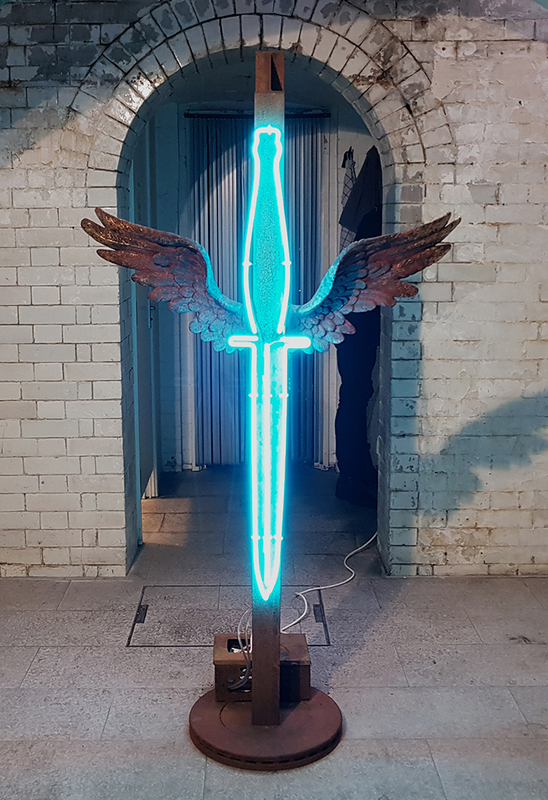 aluminium laminate, fairground luminaries, acrylic, crystal, steel throwing knives in split frame. Di-bond aluminium laminate, fairground luminaries, acrylic beads, crystal droplets, stainless steel throwing knives in split frame. 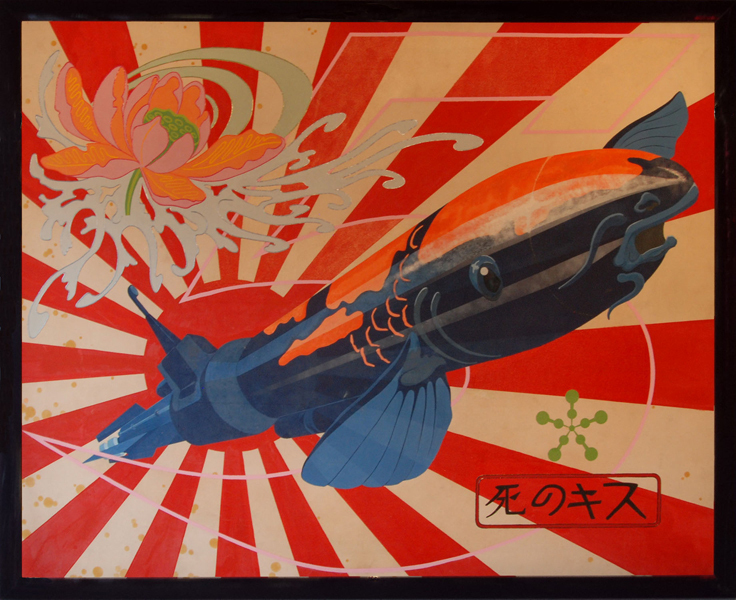 90 X 280 X 12 cm Unique artwork. 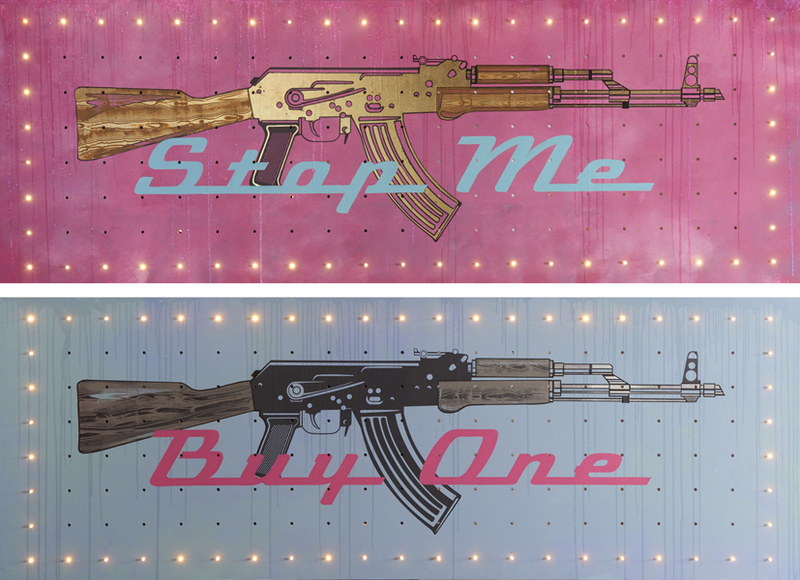 Screen print on perforated steel, neon, mirror and decommissioned AK47 assault rifles. 112 x 91 x 15 cm Unique artwork. Acrylic, screen print, micro-spherical bead appliqué on paper. Framed. Oil paint, micro-spherical bead appliqué. Framed. Antique type writer, Edison bulbs, EL wire aluminium, etched brass sheet on ornate wood and marble table. 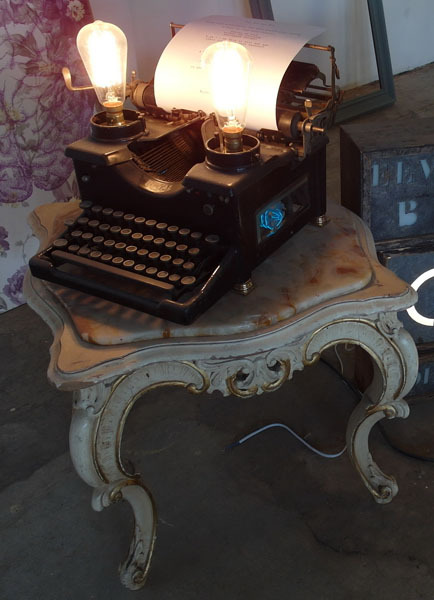 Antique type writer, Edison bulbs, EL wire aluminium, etched brass sheet on ornate wood and marble table. 90 x 50 x 50 cm Unique artwork. 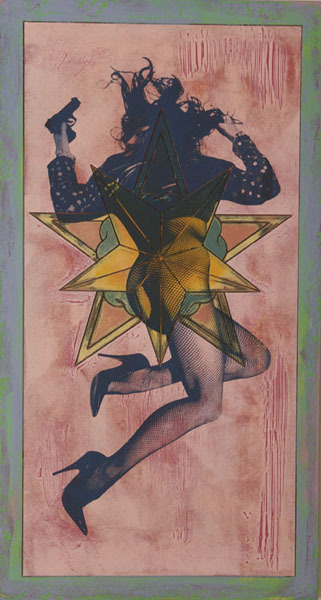 leatherette, digital print, acrylic, wood. leatherette, digital print, acrylic, wood. 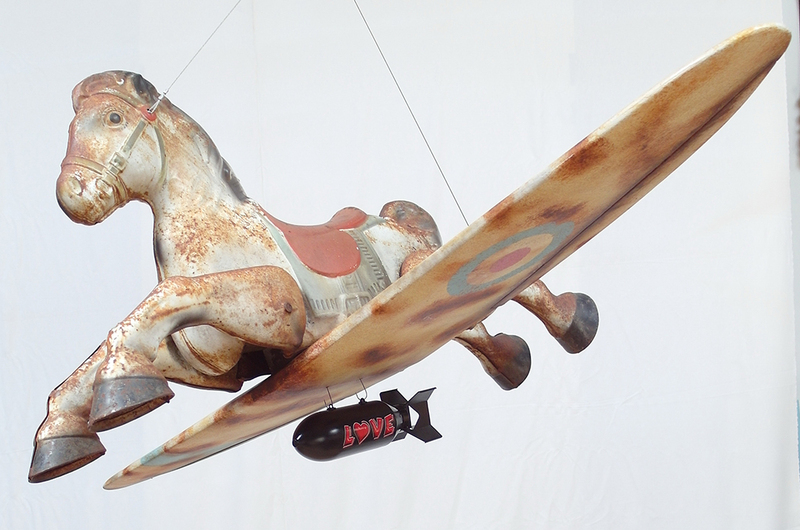 185 x 66 x 53 cm Unique artwork. 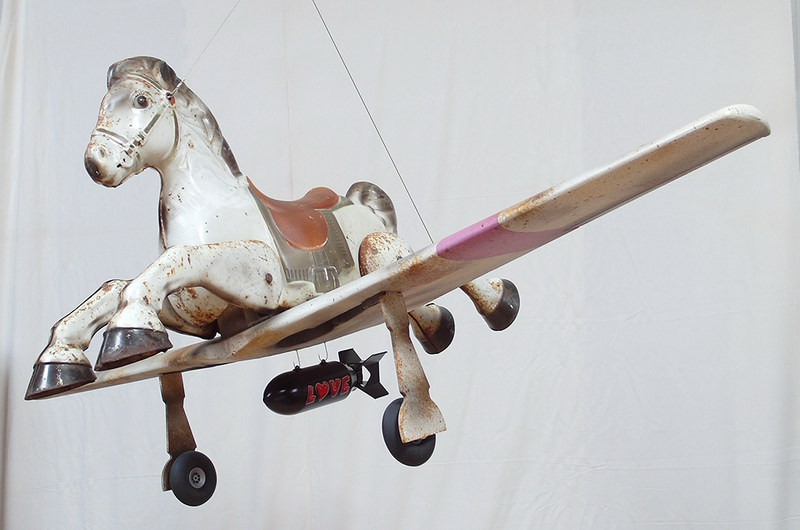 Antique rocking horses, aircraft wings, acrylic, oil, resin.